Watch this video trailer, created by Peter Ruocco for the Shotgun Players production. "Black Rider is a rare stage experience. To see it for the music alone would be reason enough, or the acting, for that matter, or simply for the sheer extravagance and theatricality of the production." "Shotgun’s daring Black Rider aims for, and pierces, the American heart... Disaster is the governing spirit for Burroughs, Tom Waits, and Robert Wilson in their neo-Brechtian musical, which gets an acid-soaked reworking under Mark Jackson’s inspired direction... To see the cast lined up on the stage is to see America: every race, an array of ages, small and tall, the bald and the hirsute. There’s a joyous democratic spirit present... The production is truly post-traumatic, a show fueled by the shock and desperation of knowing that you have shot a gun, that you have enjoyed hearing the crack of the bullet, and that when the smoke has cleared, you have murdered someone you loved. It’s quite a message for a show and production of such stunning grace and pleasure." "Perhaps the most remarkable aspect of this production is director Mark Jackson’s inspired gender-bending casting along with the chosen actors’ performances... Jackson brings all of the creative elements in sync... Exemplary and well worth seeing." "...Winter is truly here. 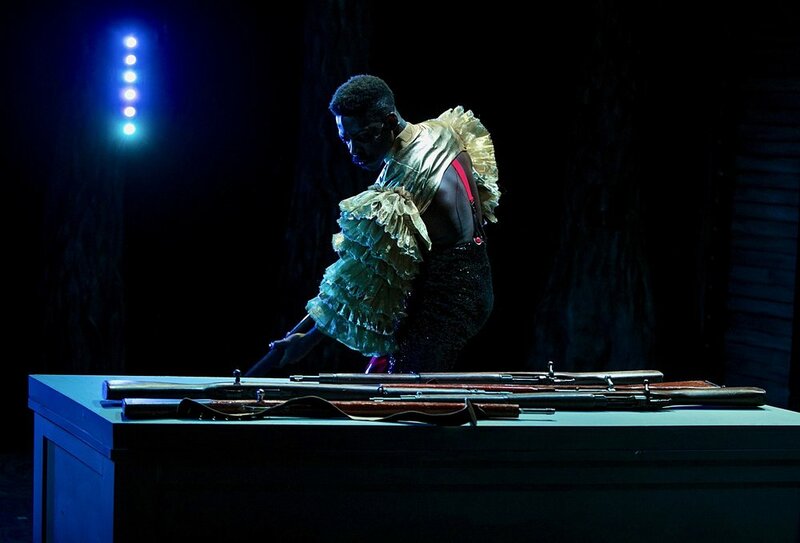 And while Jackson's winter feels especially fraught with uneasy tension, for those who enjoy dark productions, the Shotgun Players have got the show for you." "Wonderfully dark, creepy, and altogether entertaining... Director Jackson's lively production immediately strikes a mad carnival tone, combining the feel of a sideshow with vaudeville brio and dingy showbiz razzmatazz for a Rider that feels energized by the sheer joy of telling a grim story weighted by moral and metaphor..."
"Imaginative writing, top caliber performances, and rhythmic storytelling guarantee an intriguing evening. Exquisite grotesque characters inhabit a hilarious, sinister world... Black Rider probes addiction, patriarchy, and violence. The superb cast challenges our human willingness to sacrifice goodness to satisfy desire. Above all, the evocative, unsettling Black Rider offers great art for theater lovers." "Dark, weird—and right on target... Director Jackson amps up the weirdness in his production with plenty of stylized physicality. Noelle Viñas’ Kätchen somberly recites poetic litanies while slowly skipping hopscotch or impassively performing a series of amusingly familiar popular dance moves. 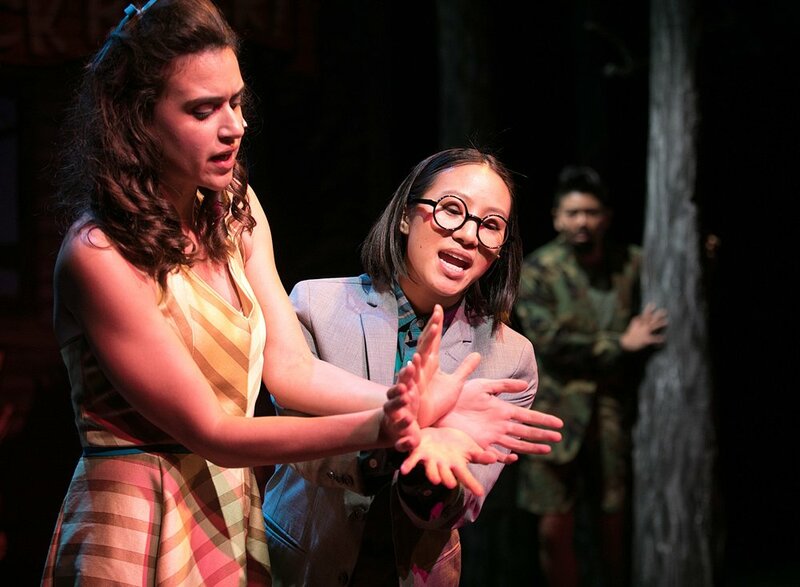 Grace Ng moves as if being yanked about by an unseen force in a breathtaking, acrobatically frenzied performance as the nerdy clerk Wilhelm... A bewitching and pitch-black fairy tale that’s as riveting as it is cheerfully macabre." 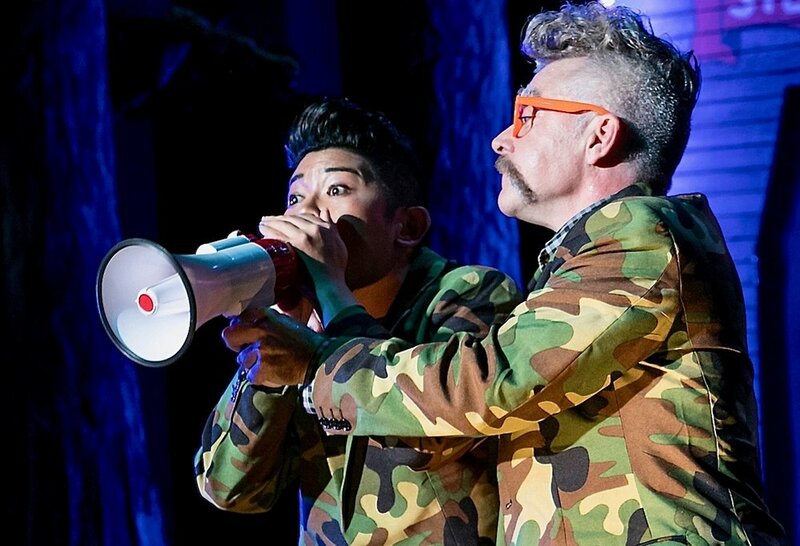 "The sheer artistic integrity, the thoughtfulness with which Jackson constructs every aspect of a moment musters a sublime sensory power of its own, as when Wilhelm (Grace Ng), deep in his addiction to success, fires his last, deadliest bullet... And in Grace Ng’s devastating performance of Wilhelm’s final song, 'Lucky Day,' the suffering isn’t so much sad as horrific — which is perhaps the ultimate point of Black Rider. Our capacity for bloodshed vastly surpasses our capacity to feel." "Cartoonish, bizarre, freaky, spooky, intriguing, confusing, disturbing... Mark Jackson directs in a highly stylized, often over-done mode that borders between what one might see in an animated film and what one could expect from a B-rated horror movie... What is clear from both the script of Black Rider and this director’s interpretation in the Shotgun Players production is that the devil we need most to fear is not the one we may meet someday, but the one we carry around inside us all the time." I don’t believe The Devil has ever made anyone do anything. We are each 100% responsible for our own actions. This thing we call "The Devil" is a metaphor for any impulses we’d rather not admit to having. That age-old myth of "The Deal With The Devil," given form by countless artists—Bulgakov, Goethe, whoever wrote The Bible—is likewise a metaphor for the bargains we make with ourselves, participating in systems we don’t believe in, gambling away our integrity for the sake of our desires. The three unique artists behind BLACK RIDER—William S. Burroughs, Tom Waits, and Robert Wilson—created a modern fairytale nightmare for adults that broods on the powerful and pervasive patriarchy. Like all truly great artists, this trio made no attempt to assume answers, favoring the audience’s imaginations instead and content to let us be responsible for our own interpretations. Maybe this open quality is why BLACK RIDER has been revived so often since it premiered in Hamburg, Germany, back in 1990. Maybe this is also why the show can be as unsettling as it is entertaining. Or maybe it’s unsettling because it entertains. In that respect alone it's a peculiarly American take on the traditional European fairytales that inspired it. The last thing I’ll say is to simply acknowledge that when Shotgun Players produced BLACK RIDER, we found our country in a very particular place with regard to its systems and assumptions about gender and race, among other aspects of our American culture. Considering that, I did hope the production would unsettle and entertain, and the general response seemed to indicate both had happened in a variety of ways. I don’t expect any production to change the world, or America. That’s not the role of art anyway. That's our role as citizens, making our own choices—not just when interpreting a musical or in key Novembers, but every single day. And when the sun is threatening to set, and a crow clutching a nearby branch has its eye on us, do we truly value our integrity over our desires? The crow knows.